One of the most commonly debated questions of individuals shopping for a mattress is “should I buy a firm or soft model?” While the most predictable answer would be to opt for the safe or in the middle of the firmness levels, there really is no simple black and white yes or no answer to this – not even gray. How Does a Soft Mattress Affect Your Sleep Quality? Is a firm one better? There is actually no scientific evidence that suggests sleeping on a firm surface is better for you. In fact, more often than not, it’s actually the firmer mattresses that aren’t always better for your back or if you have existing conditions. Consider this; if the surface is too hard, there will be no contouring of the body during the different sleeping positions you choose. If there is no contouring this will create pressure points thus aggravating joint pain, plus there will be limited spinal alignment which will cause lower back pain and other related issues. If you already experience any kind of pain or discomfort due to an existing medical condition, you may want to think twice or consider seeking professional medical advice before purchasing one which may be too firm. Is a plush mattress better? We all are enamored by a soft model – it’s the plush factor after all, but if you have any kind of joint or back pain, then you must consider an alternative as this may be contributing towards your discomfort. Imagine if the surface is too soft, the sinking sensation which occurs through gravity when one lies down will cause the body to sink too much, thus creating a downwards bend in the spine. As we have already discussed the importance of a straight spine, you’re probably aware that this scenario can lead to all types of back pain. Aside from spinal alignment, in terms of padding, pressure relief and other types of support, these softer options aren’t so bad. Firm support with a soft feel – The best of both worlds. Previous research has actually shown that if you suffer from low back pain then a medium is better and will provide more comfort than a firm or soft model. Ultimately these should provide the best of both worlds, i.e optimal spinal alignment, and good pressure point relief for the rest of the body. There is also a difference between beds with firm support and those which have a firm feel. You are better off purchasing one that has firm support, with a soft feel, that way you get benefits of both a soft and firm model. It is comfort which will ultimately determine your personal preference. Soft mattresses often have add-ons to boost the comfort and support factor of their beds. The manufacturers typically offer the choice of comfy-cozy plush top layers or the popular pillow-topped surfaces. Their names are self-defining and without a doubt precisely describe their distinctive feel. Softer types have plenty of give in order to support and contour to your body’s natural shapes and curves. The problem with these types of beds can actually be purchasing one without knowing what your body needs in terms of support – not just based on what feels initially best. Lightweight – Firmness is a subjective measure. One person might think a specific model is firm, while another person might think that it isn’t that firm. However, on the whole, people who don’t weigh very much will tend to think a mattress is firmer than those who weigh more. For this reason, typically lighter weight people will want to get a softer model to make up for this fact. Side-sleepers – People who opt to sleep on their sides need a softer option. This improves blood circulation and promotes a restful and long sleep. I am curious why people can’t understand that the same thing happens with a hard, firm model. Poor circulation throughout the body is the primary cause of restlessness and constant repositioning throughout the night? Take that away and we are on our way at the very least to an improved night of sleep. You want it copper-infused – This is a technology that makes your sleeping surface extra cooler; plus, it also improves blood circulation. You want to sleep cool – The copper infusion and Thermo gel cover both help make it sleep cool. You want more value for money – The flipping and infused-copper are new features, and all at a similar price to a lot of the other online-options. Definitely a steal compared to a lot of traditional retail store memory foam options. You like the “flippable” option – One side soft, one side firm, flip at your convenience. The firmer side is at around an 8 out of 10 while the softer side is at around a 5-6 out of 10, 10 being the firmest. If you want something that speaks a whole lot about you – your sleeping style and preferences, then this is your best bet. The Helix is all about personalization. You actually have to take a quiz that asks you questions about your body type and sleeping preferences before getting to the checkout, and the final product will actually change based on your answers. 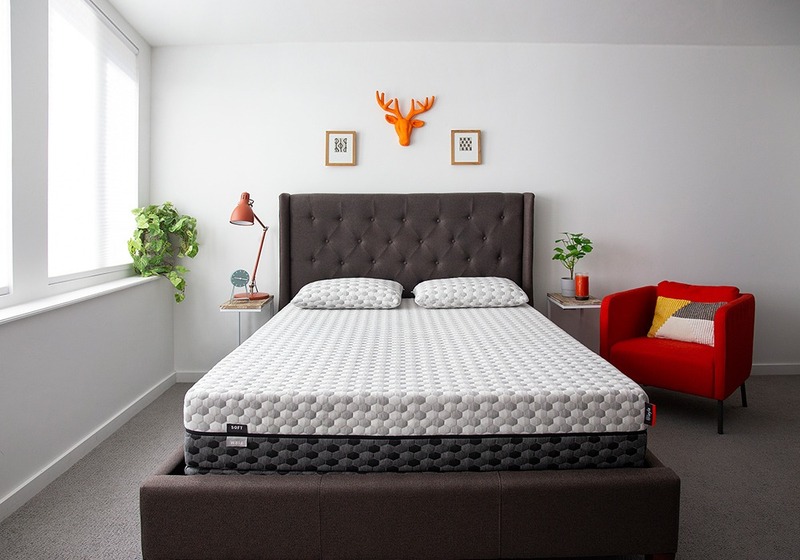 You believe in personalized or customized sleeping experience – Many companies are pitching the “one mattress fits all” line, but many people don’t believe that’s true. The Helix is the first online-only company to offer such a variety of options suiting many different types of sleeper preferences. This is their strongest plus point to many consumers out there. You want an expert model– Helix worked with a couple of PhDs to determine what sleeping factors were most important and how they could address these factors in their mattresses. This is a model with a lot of data pointing it in the right direction. You like a latex foam feel – For all its personalization, it’s still a latex-like foam feel overall. You are sleeping with a partner – Not only can you personalize it, you can personalize each side of it to accommodate the preferences of two people. This model can be great for couples. Loom & Leaf offers 2 models with different firmness options, catering to a wider range of customers: Firm (8 out of 10) and Relaxed Firm (5 out of 10), 10 being the firmest. If you’re into plush mattresses, then the Relaxed Firm is the perfect fit for you. It’s considered to be one of the most popular plush mattresses in the market today. You love value – The Loom and Leaf offers great value, and is priced well for a model competing at the luxury level. The price tag is steep for some buyers, but a steal if you compare it to the major brands. You are looking for the combination of comfort and support – The high-density memory foam conforms nicely to the body and supports proper spinal alignment, upholding the known standard for high-quality memory foam. This is great for relieving and/or preventing back pain. At the same time, it is quite comfortable and I think you’ll find it’s a very cozy sleeping experience. It is an excellent memory foam mattress with supportive foam layer. You’re sharing the bed with a partner – The high-density memory foam is great for motion isolation. That means when your partner moves around, you generally won’t feel it. You’ll both get a better night of sleep because of it. We’ve seen people argue about the firmness level of a mattress more times than we care to admit. Someone might think something is soft, while another person thinks the same mattress is firm. Keep in mind that another person’s idea of a “soft” mattress may be different from you. Don’t just assume that if a mattress is soft, it’s going to be a good fit for you. You’ll still want to make sure that the mattress has good, durable foams, that it won’t sleep hot, etc. Once you’ve made sure you like the softness of a mattress, do the extra research to make sure that the other aspects of the mattress are a good fit for you too.